We were spared the full heat of this very dry summer but still enjoyed our very nice Heinseck Champagne on the veranda overlooking the Manchester skyline from the King Street Town House. The gentlemen were resplendent in their summer suits and the ladies in their best summer frocks! 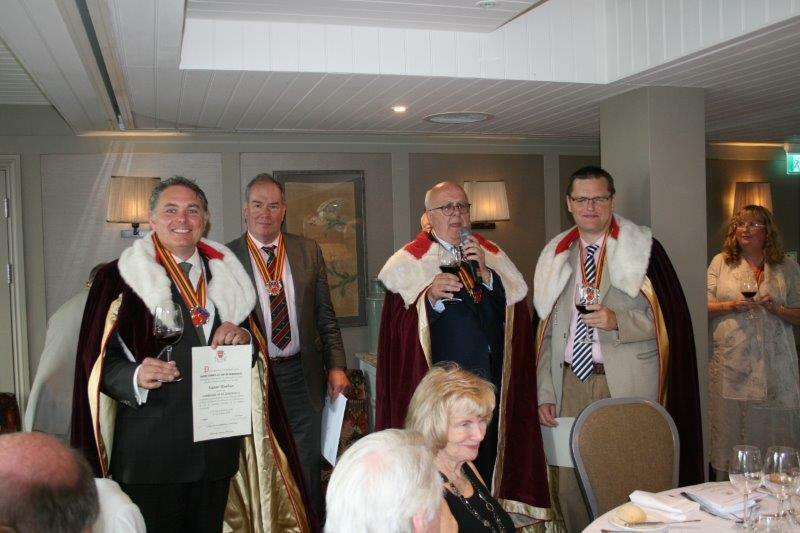 All commandeurs with their regalia were ready to intronise two new members to the cause of promoting Bordeaux wine. The meal itself exceeded the high standards that the Kings Street Town House sets itself and the wines were of a very high standard too. We started the meal with an interesting Atlantic crab and lobster bon bon with its squash and lime velouté, which had a fresh and clean taste with a touch of spice. Fortunately, the Commanderie had found the perfect wine in the Château Montlau 2017, A.O.C. Entre-Deux-Mers to go with it during their recent trip to Bordeaux and the unusual blend of grapes and this modest, clean and fresh tasting wine was quite a find. The centre piece of the meal was the delicious and consistently well-cooked Fillet of beef with shallot marmalade, celeriac purée, Pommes Anna and port wine jus. It is a testament to the chef and cooks at our venue that they could achieve this quality for the numbers of diners that we had. We were not distracted by too many trimming but the Château Chasse-Spleen 2000, Cru Bourgeois A.O.C. Moulis (despite one bottle with some issues) was a delicious wine to go with the steak, showing the high standards to which Cru Bourgeois can reach. We were even treated to a fun story about a former cabinet minister’s liking for this wine! The second red was Château Haut-Marbuzet 2006,Cru Bourgeois A.O.C. St-Estèphe and was also very enjoyable with a bit more oak on the palate and went very well with the tasty and generous selection of cheeses. The meal was topped off with a delightful trio of desserts: apricot & lemon tart, chocolate profiterole, raspberry and lychee cheesecake and was a pudding lovers delight! The Château Raymond-Lafon 2009 was also a Sauternes lover’s delight with a lovely balance of marmalade, honey and floral elements. 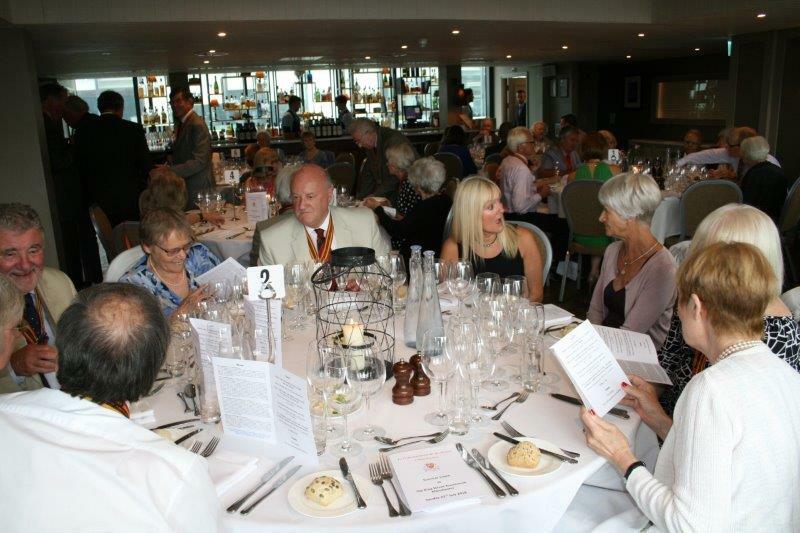 We had an opportunity for further catching up with those friends not seated on our tables after the meal and departed on (by now) a lovely summer’s evening, having thanked our hosts in the usual way.